China has broadcast pictures taken by its rover and lander on the far side of the moon, in what its space programme hailed as another triumph for the groundbreaking mission to the less-known part of the lunar surface. The pictures on state broadcaster CCTV showed the Jade Rabbit 2 rover and the Chang’e 4 spacecraft that transported it on the first soft landing on the far side of the moon, which always faces away from Earth. The pictures were transmitted by a relay satellite to a control centre in Beijing, although it was not clear when they were taken. 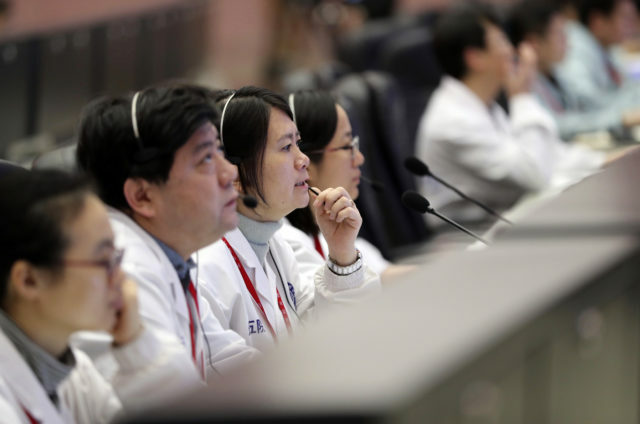 Zhang Kejian, director of the China National Space Administration, said: “The lander, its rover and the relay satellite are all in a stable condition. They have reached the predetermined engineering goals, right now they are getting into the stage of scientific searches. The pictures show a rocky surface with the jagged edge of craters in the background, posing a challenge for controllers in plotting the rover’s travels, the official Xinhua News Agency said. Among the images is a 360-degree panorama stitched together from 80 photos taken by a camera on the lander after it released the rover on to the lunar surface, Xinhua said, citing Li Chunlai, deputy director of the National Astronomical Observatories of China and commander-in-chief of the ground application system of Chang’e 4. The space administration also released a 12-minute video of Chang’e 4’s landing, using more than 4,700 images taken by an on-board camera. It is popularly called the “dark side” because it cannot be seen from Earth and is relatively unknown, not because it lacks sunlight.